We shouldn't get too ahead of ourselves when it comes to Rush Hour 4 and, perhaps to a lesser degree, The Karate Kid 2. Recently, there has been a lot of talk that Jackie Chan and Chris Tucker may finally reunite for another Rush Hour movie. Also, apparently, there has been some talk that a follow-up to his Karate Kid remake is in the works. However, some false information regarding both of these projects has been making the rounds and now, the actor's representatives have stepped in. Essentially, according to a letter shared to the official Jackie Chan website, someone has been falsely using the email of Esmond Ren, described as a "motion picture industry professional." The unidentified individual has been spreading incorrect information relating to staffing cast and crew for these alleged sequels. Now, Chan's reps are making sure it's very clear that the martial arts legend has nothing to do with any information being spread around by this particular person. Here's what the letter had to say about it. "We have noticed that false information that Mr. Chan would act in the motion pictures Rush Hour 4 and The Karate Kid 2 is spreading through multiple social media platforms, and that certain apparently infringing parties have misappropriated the personal WeChat and email accounts of Mr. Esmond Ren, a motion picture industry professional, to release false information concerning the hiring of the crew, casting, audition and other matters in connection with the pictures Rush Hour 4 and The Karate 2. With respect to the above information, on behalf of Mr. Chan, we hereby declare that any and all such information, as spread by such infringer relating to Mr. Chan providing or about to provide acting services in the motion pictures Rush Hour 4 and/or The Karate Kid 2 is false; any relevant information released by any infringer through appropriating the personal WeChat and email accounts of Mr. Esmond Ren is false, and Mr. Chan does not have anything to do with such released information or the content thereof." First of all, anytime someone is misrepresenting themselves in a professional manner as something they're not, it's more than unfortunate for those on the receiving end of the wrong information and for those who are being misrepresented. The letter also makes it very clear that this is illegal and that Jackie Chan and his reps will take legal action if necessary. So this could get ugly for whoever is responsible. Now, for those who were excited about the possibility of either of these movies happening, here's what this means. 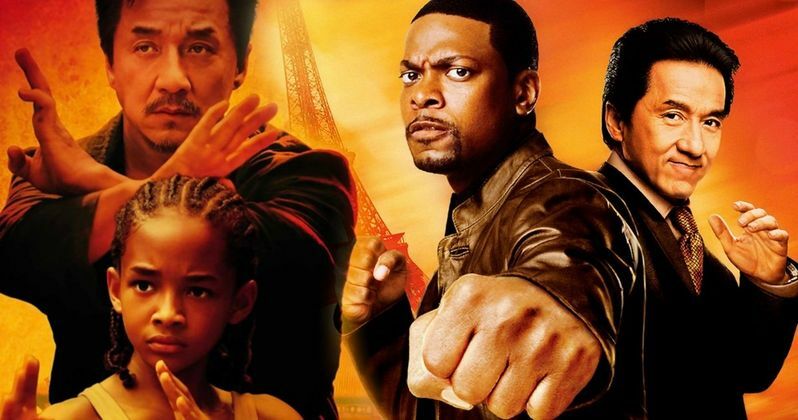 Rush Hour 4 and, again, to a lesser degree probably, The Karate Kid 2 could still happen. This just means that any information being spread by this individual relating to the alleged productions is false. It's entirely possible that there are legitimate actions taking place behind the scenes to make one or, who knows, maybe even both of these things happen. We just have to wait for official word from the studio. Not some sketchy casting email. Recently, Chris Tucker shared a photo with Jackie Chan on his birthday, with both of them holding up four fingers, which sparked a whole lot of talk about the possibility of Rush Hour 4. Tucker has confirmed publically that the movie is being worked on. So while this letter is definitely an ugly thing, it doesn't mean we can't still get excited about the possibility of a Tucker/Chan reunion. The full letter can be found at JackieChan.com.